Getting admitted into college is one of the earliest and most difficult challenges students face in life. But at Saint Andrew’s School, students embark on the journey towards college acceptances with the strength of the school behind them. Saint Andrew’s School is particularly proud of its senior class - the class of 2019 - as they hear from prestigious colleges and universities from all over the country, and the world. Instead of worrying over the question: ‘Did I perform enough civic or community service?’ or ‘Are my grades strong enough?’ many Scots have already been accepted to schools distinguished as the “Most Competitive” or “Highly Competitive” in the 2019 Barron’s Guide to Colleges. “Once again, our students are really outperforming the market,” said Dr. Bouressa, Director of College Guidance at Saint Andrew’s. For instance, take a close look at these four SA seniors - Andrew Weiss, Caroline Fulton, Jasper Bendeck, and Noelle Norona - and their impressive college acceptances. Each senior has a story about the role Saint Andrew’s has played in their journey to college. “I have been accepted to Brown, and I will be attending there next fall,” said Jasper Bendeck. Brown, an Ivy League School, has excellent math and science programs. Jasper feels that Saint Andrew’s has uniquely prepared him for his studies at Brown. At the top-end schools, like Brown, nearly all prospective students will have straight A’s, participate in programs like IB, and top scores on admissions tests. And it’s clear that Jasper has superior talent in Mathematics and Science, as well as top scores. “At Saint Andrew’s, we focus on each student’s individual talents and exceptional abilities,” said Dr. Robert Bouressa. Jasper shares superior talent with many other seniors like fellow Scot Caroline Fulton. She’s been accepted to the University of Virginia, Villanova, and Boston College - three of her four top choices. She is also excitedly awaiting news from Georgetown. Caroline is certain that her choice will have a lot to do with what she values from her experience at Saint Andrew’s. “I really appreciate a balanced atmosphere in a college - just like I’ve experienced here at SA. I want a place that’s going to provide me amazing academics, but also provide clubs, extracurricular activities, fun dorm experiences, ability to connect with international students, and such good school spirit,” said Caroline. “All four of my favorite colleges have that quality of - yes - being great schools, but also being able to develop me in so many aspects of who I am as a whole person, just like Saint Andrew’s,” she added. Noelle Norona, a future freshman at the University of Chicago, echoes Caroline’s judgment about making college choices. Noelle gives credit to the SA College Guidance office for their support throughout the process. “My guidance counselor nurtured my desire to apply to the UChicago. She knew it was a great match for me. She cared about how much I love learning and need to find a place that is intellectually focused. UChicago has its own character that way and I know and my College Guidance Counselor knows that it’s an amazing fit for me,” said Noelle. Andrew Weiss, accepted and committed to Washington University, connects his desire to attend with his experience at SA. “WashU reminds me of Saint Andrew’s in a way. It’s a mid-size school, and I can be a ‘mind, body, spirit’ student there. The school focuses on developing strong relationships between students and faculty, such as offering office hours and research opportunities,” said Andrew. It takes a concerted effort on behalf of the College Guidance team to make close connections with top universities to increase the visibility and recognition of Saint Andrew’s and its students. “As mysterious as college admissions may seem to be, there is no great mystery,” mused Dr. Bouressa. His team personally visits many colleges and universities and hosts their deans and staff when they visit South Florida. 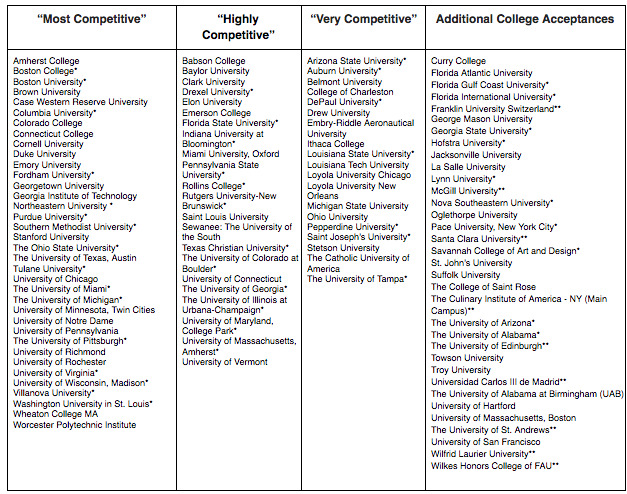 Each year, the college guidance team hosts well over 200 individual college admissions representatives on campus. The team also provides presentations at regional and national admissions conferences, and are members of leading organizations such National Merit, IBO, university advisory boards, and scholarship programs. In addition to the amazing professional acumen of the SA College Guidance office, Caroline Fulton’s reflections on her College Guidance process brings to the surface another key Saint Andrew’s advantage in the journey towards acceptance. Caroline’s eyes lit up as she spoke about Mrs. Tammy Friedman, her College Guidance Counselor, saying that she’s been as happy and supportive of her as a parent. Saint Andrew’s expects more exciting news about college admission in the months to come. A complete guide to 2019 college acceptances will be made available in May. Take a close look at these excellent colleges and universities that have made early offers of admission, and celebrate with SA as it honors the class of 2019. Go Scots!